We recognise that when parents employ a doula they may discuss or disclose personal information and this information is to be kept confidential by the doula employed. This means that any information provided by or about a person shall not be given directly or indirectly to anyone else without the express permission of that person, excepting situations where there is a legal obligation to do so. 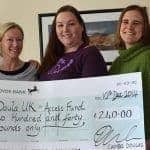 General information may be shared with other doulas within the Doula UK network but in an anonymised format for the sole purpose of support, supervision or training. Any publicity or report on the work of Doula UK should not disclose information that might identify an individual client or doula without their express permission. Any confidential information should be stored and/or destroyed appropriately. We are proud that our membership represents a diversity of age, race, religion, culture, language, disability, marital status, education and outlook. Similarly, members of our network will not discriminate, but will offer to be a doula to any woman who requests her services regardless of any of these types of differences. As an organisation we aim to treat our members and volunteers fairly and with respect at all times. Similarly members of our network show the same fairness and respect to their clients.